BEIJING - More than 3,000 Chinese nationals have been evacuated from Vietnam, state news agency Xinhua said on Sunday, following deadly rioting that stemmed from an outpouring of rage over Chinese oil drilling in a disputed area of the South China Sea. The violence was triggered by China's positioning of a $1 billion oil rig in a part of the South China Sea claimed by Hanoi, a move described by the United States as provocative. It is the worst breakdown in ties between the two Communist neighbors since a short border war in 1979. 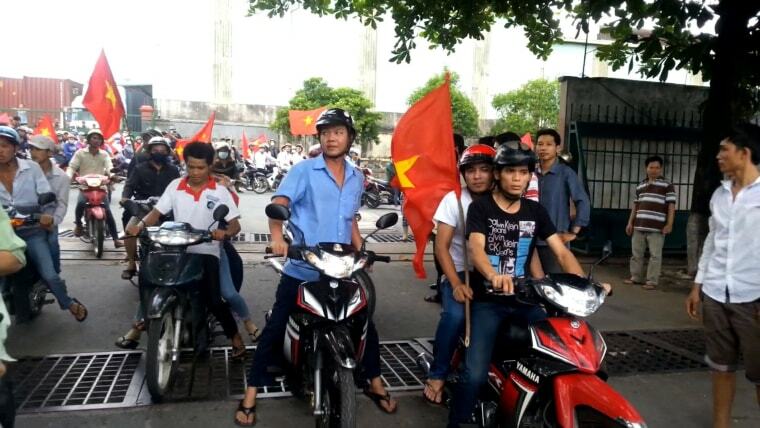 The trouble broke out in Vietnam's south on Tuesday after nationalist rage boiled over during protests around industrial parks near Ho Chi Minh City, formerly Saigon. Two Chinese nationals were killed in the violence and more than 100 others injured, Xinhua said, citing China's foreign ministry. China is to send five ships to Vietnam on Sunday to evacuate more Chinese nationals, Xinhua said, citing the transport ministry In Beijing. Sixteen critically injured Chinese nationals were evacuated from Vietnam early Sunday aboard a chartered medical flight, the foreign ministry said in a separate statement. Workers from the China 19th Metallurgical Corporation, a contractor for an iron and steel plant being built by Formosa Plastics Group, Taiwan's biggest investor in Vietnam, were evacuated back to China early on Sunday, Xinhua said. Separately, China's Spring and Autumn Airline said it plans to suspend all charter flights from Shanghai to Vietnam from Monday, according to Xinhua.